Leeds United maintained their challenge for an automatic Championship promotion place with a home victory over struggling Bolton Wanderers. Patrick Bamford put Marcelo Bielsa's side in front from the spot after Tyler Roberts was fouled in the box by Pawel Olkowski. But the visitors were soon on level terms when Mark Beevers forced a loose ball home moments after David Wheater's header from a corner was cleared off the line. Bamford was twice denied a second by Remi Matthews, but the Bolton keeper was at fault when he misjudged Ezgjan Alioski's cross, which flew over his head and into the net via the underside of the crossbar, and they suffered a further blow shortly afterwards when boss Phil Parkinson was sent to the stands. The victory temporarily lifted Leeds into second place, but Sheffield United regained that spot with a fine win at West Bromwich Albion in Saturday's late kick-off. Wanderers made a good start to the game with Josh Magennis forcing a brilliant, reflex save from Kiko Casilla with a powerful point-blank header, and he also volleyed just wide in an open first half. Beevers' goal ended a run - which he began - of Bolton's previous seven league goals being scored by seven different players, but Leeds dominated more of the play after the break. And, although there was an element of fortune about their winner, Alioski's ninth of the season ensured they remained only two points behind leaders Norwich City. Matthews partially redeemed himself with saves from Bamford, twice, and substitute Stuart Dallas and, although Bolton's Sammy Ameobi fired just wide with his left foot, they could not find an equaliser and remained 23rd in the table, four points from safety. "It was a game very similar to other games we've played so far. "We had chances to score and we didn't score goals and we suffered on set pieces, I think this was the axis of the game. "It was a team that fought a lot, we had many chances to score and we missed many goals and dangerous actions created by the opponent were on set pieces especially." "I thought we deserved something from the game, we had some good chances first half, hit the bar in the first minute and the game plan worked well. "I thought we fatigued a bit in the second half, the second goal hurts because it's a mistake. "The work-rate and what we asked the lads to do was in place today and if we come out of these two games in touching distance we've got a good chance." "Every member of both benches was over separating it, and the referee came over and sent me off. "I'm going to ask in a minute why wasn't their manager sent off as he was outside the technical area doing the same, so were all their staff. "One of their players poured a bottle of water over Joe Williams' head, that's what started it, he didn't even get booked for it. "Out of 20 staff in the middle of a melee the referee chose to send me off and left all their staff in place." Match ends, Leeds United 2, Bolton Wanderers 1. Second Half ends, Leeds United 2, Bolton Wanderers 1. Corner, Bolton Wanderers. Conceded by Kalvin Phillips. Substitution, Leeds United. Jamie Shackleton replaces Luke Ayling. Foul by William Buckley (Bolton Wanderers). Attempt saved. Patrick Bamford (Leeds United) left footed shot from the centre of the box is saved in the top left corner. Assisted by Ezgjan Alioski. Attempt missed. Sammy Ameobi (Bolton Wanderers) left footed shot from outside the box is close, but misses to the left. Assisted by Josh Magennis. Foul by Mateusz Klich (Leeds United). Jason Lowe (Bolton Wanderers) wins a free kick in the defensive half. Gary O'Neil (Bolton Wanderers) is shown the yellow card for a bad foul. Pablo Hernández (Leeds United) wins a free kick in the defensive half. Foul by Gary O'Neil (Bolton Wanderers). Substitution, Bolton Wanderers. Luke Murphy replaces Joe Williams. Attempt saved. Josh Magennis (Bolton Wanderers) right footed shot from outside the box is saved in the bottom left corner. Attempt saved. 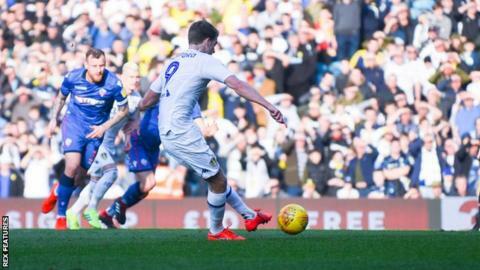 Stuart Dallas (Leeds United) right footed shot from the right side of the box is saved in the bottom right corner. Assisted by Pablo Hernández. Substitution, Bolton Wanderers. William Buckley replaces Craig Noone. Substitution, Leeds United. Stuart Dallas replaces Tyler Roberts. Foul by Jack Harrison (Leeds United). Sammy Ameobi (Bolton Wanderers) wins a free kick in the defensive half. Corner, Leeds United. Conceded by Remi Matthews. Attempt saved. Patrick Bamford (Leeds United) left footed shot from a difficult angle on the left is saved in the bottom left corner. Assisted by Pablo Hernández. Attempt missed. Jack Harrison (Leeds United) left footed shot from outside the box misses to the right following a corner. Corner, Leeds United. Conceded by Mark Beevers. Foul by Josh Magennis (Bolton Wanderers). Substitution, Bolton Wanderers. Sammy Ameobi replaces Clayton Donaldson. Joe Williams (Bolton Wanderers) is shown the yellow card. Josh Magennis (Bolton Wanderers) is shown the yellow card for a bad foul. Goal! Leeds United 2, Bolton Wanderers 1. Ezgjan Alioski (Leeds United) left footed shot from outside the box to the centre of the goal. Assisted by Mateusz Klich. Ezgjan Alioski (Leeds United) wins a free kick on the left wing. Foul by Clayton Donaldson (Bolton Wanderers). Pablo Hernández (Leeds United) is shown the yellow card for a bad foul. Foul by Pablo Hernández (Leeds United). Clayton Donaldson (Bolton Wanderers) wins a free kick in the defensive half. Attempt blocked. Pablo Hernández (Leeds United) right footed shot from outside the box is blocked. Assisted by Patrick Bamford with a headed pass.